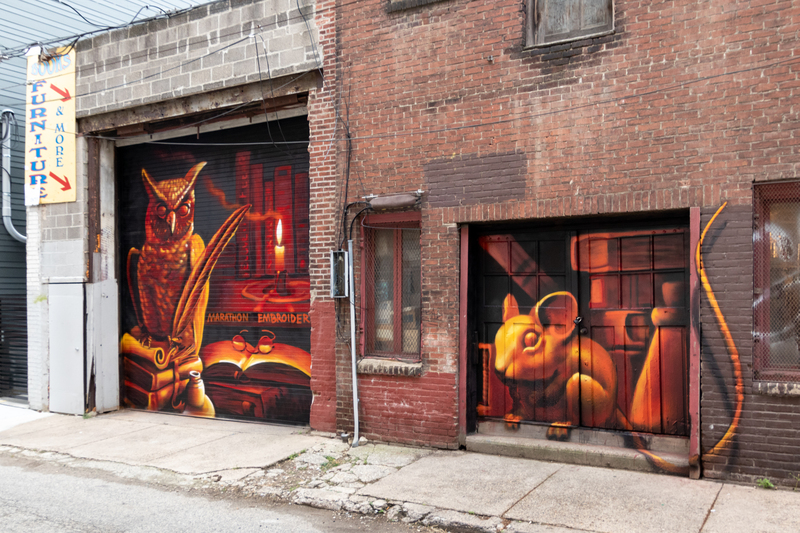 In August, two murals appeared in an alley off of South Street. 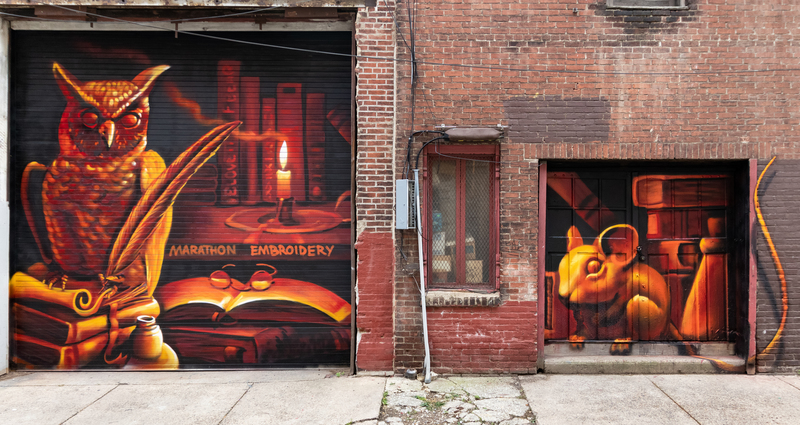 Painted by artists Bear215 and Evan Lovett, they show an owl and a mouse sitting on some books. I love the warm colors and the way the artists hid their names on the spines of the books. But the best part might be the story behind them: one of these murals was an accident! Bear recounted the story. In late July, Bear’s friend Evan asked him to find a wall for them, saying, “We are going to paint for free and just have fun.” He started asking around in some Facebook groups, but no good spots were popping up – they really wanted it to be visible from the street. So Bear started thinking more locally. 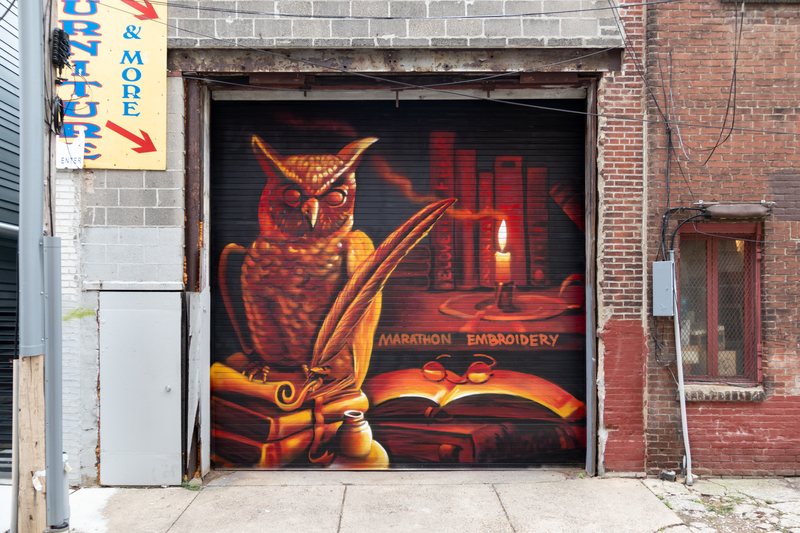 “Working at Tattooed Moms, I frequent the ally behind it and always thought the big garage door [across the street] could use a mural, so I went in to speak with the owners.” The building in question was Mostly Books, and both the owner and landlord loved Evan’s concept sketch. 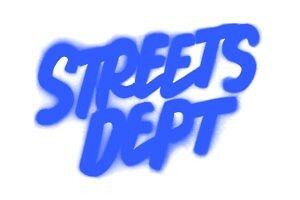 So they approved the idea, excited to have some art on their building! It turns out that Mostly Books had been split at some point. So even though a giant sign advertising “books, furniture, & more” remains above the garage door they had painted, it was now actually the back of Marathon Embroidery! Fortunately, the owner of Marathon called back, laughing, and told them that he loved the mural and just wanted them to add the name of the shop. Now there was just the matter of the Mostly Books doors they had originally set out to paint. “I went back and told the bookstore that it was smoothed over, and they asked if they would still be getting their mural,” said Bear. 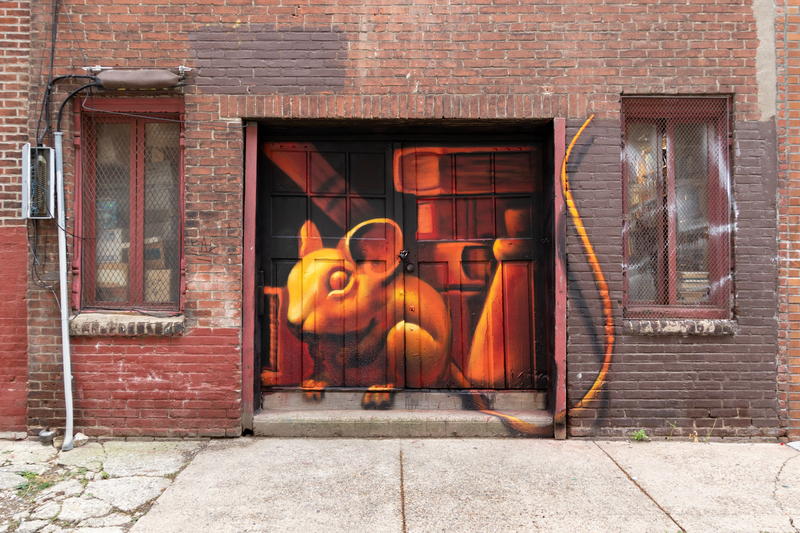 “I said ‘Absolutely.’” So they painted a mouse right next door. Now both shops have a mural! 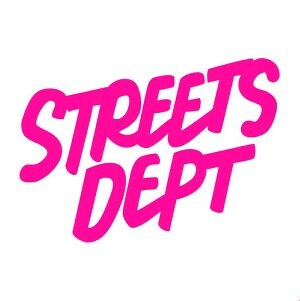 You can find them on Kater street between 5th and 6th streets in Queen Village. Sweet story. Lovely ending. And we got two murals .. instead of the one!